HOUSTON, TEXAS (October 31, 2010) The San Jacinto College (SJC) women’s basketball team opens the 2010-2011 season Monday night, Nov. 1, at home against Temple College. Tip-off is slated for 5:30 p.m.
San Jac, picked to finish seventh in the Region XIV conference, returns just one player from last year’s team that finished 6-23 overall. Sophomore Ebony Atkins played in 13 games, averaging 7.3 points and 4.9 rebounds. Head Coach Eric Taylor expects Atkins to provide leadership on the court to his slew of newcomers. SJC will host 14 games during the regular season. Region XIV home games include Trinity Valley Community College (Dec. 1), Angelina College (Dec. 8), Lon Morris (Jan. 5), Panola College (Jan. 15), Kilgore College (Jan. 22), Paris Junior College (Jan. 29), Blinn College (Feb. 9), Tyler Junior College (Feb. 16), and Jacksonville College (Feb. 26). The Tyler game is part of the Women’s Basketball Coaches Association (WBCA) Pink Zone, a national initiative to raise breast cancer awareness on the court, across campuses, and in local communities. San Jac will also host Hill College (Nov. 5), the San Jac Classic (Nov. 19-20), and Louisiana State – Eunice (Feb. 23) at home. 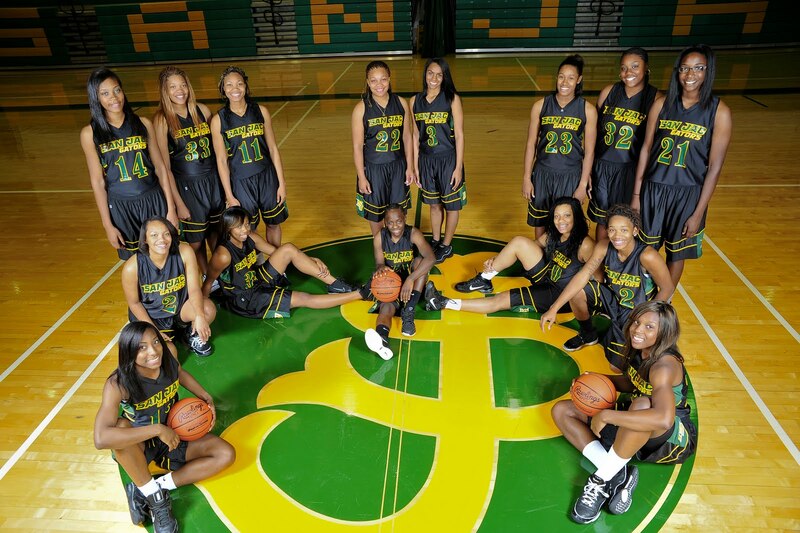 San Jac will face the same Region XIV opponents on the road, but will also play at the Southern University – Shreveport Classic (Nov. 12-13), at Hill College (Nov. 17), at the Southwest Tennessee Lady Salquis Classic (Dec. 28-29), and at Louisiana State University-Eunice (Jan. 10). The 2011 Region XIV tournament will be played March 3-7 at the University of Texas at Tyler. The national championship tournament once again returns to the Bicentennial Center in Salina, Kan., in March. The Cowboys were the first to draw blood on an 8-yard run by quarterback Jacob Bower. With the one-punt conversion by kicker Josh Lewis splitting the uprights, the Cowboys took the early 7-0 lead. The scoring drive consisted of 80 yards on 12 plays and lasted 5:08. McNeese came back after one set of downs by Nichols to score on their second drive of the game. A one-yard rush by tailback Champlain Babin increased the Cowboys lead by six. With Lewis again splitting the uprights, McNeese had a 14-point lead with 3:46 left in the 1st quarter. The drive lasted a mire 2:19 and consisted of five plays and 28 yards. The Cowboys continued in the second quarter as Bower drove 40 yard in eight plays to connect with tight end Corday Clark on a one-yard pass for a touchdown. Lewis again added one point off his foot to increase McNeese’s lead to 21-0 with 11:18 left in the half. Nicholl’s finally found the end zone with 56 seconds left in the half. Quarterback Landry Klann scored on a one-yard keeper. Along with Andrew Dolan’s kick, the scores cut McNeese’s lead to 14 points at halftime. The Colonels scored again at the 10:17 mark in the 3rd quarter when Klann connected with receiver Kenyad Blair on a 35-yard pass. Dolan again added one to make to score 21-14. The Nicholls’ drive lasted 1:58 and consisted of four plays on 49 yards. McNeese had a chance to increase their lead to 10 with 6:33 remaining in the 3rd quarter on a 43-yard field goal by Lewis. His kick was wide and the Colonels took over at their 26 yard line. Lewis did connect on his second field goal attempt of the night. He booted the ball 21 yards to add three points to the Cowboys total. Bower connected on 12 of 21 passes for 112 yards and one touchdown. Andre Anderson rushed for 171 yards on 29 carries, averaging 5.9 yards a carry. On defense, Deron Minor had seven unassisted and two assisted tackles for a total of nine for the game. Klann completed 14 of 18 passes for 150 yards in the Nicholls’ loss. McNeese is now 4-4 on the season and 3-1 in Southland Conference play. They will travel to Huntsville, Texas next weekend to face San Houston State. Nicholls State drops to 2-6 for the season and 1-3 in conference play and will SFA next weekend at home. loose and Ron Jackson recovered the ball for Texas State at SFA’s 20-yard line. the two-point conversion to make the score 24-14.
extra point to pull the Bobcats to within 24-21. Texas State’s 40 yard line before Moses hit Jeremy Barnes with a six-yard pass. Bobcats’ T.P. Miller recovered the ball at the Texas State 34-yard line. 47-yard field goal attempt was wide left to give the Bobcats the victory. kicked the extra point to give the Lumberjacks a 7-0 lead. pass to Crawford before throwing an eight-yard touchdown pass to Kris Lott. Henshaw’s extra point gave the Lumberjacks a 14-0 lead. Bush was tackled just short of the goal line to give SFA possession of the ball. Henshaw’s extra point made the halftime score 21-0.
storming back in the fourth quarter. while Griggs caught four passes in the second half for 27 yards. for 72 yards and a touchdown. LAKE CHARLES, LOUSIANA (October 30, 2010) The McNeese State Cowboys (3-4, 2-1 conf.) face the Nicholls Colonels (2-5, 1-2 conf.) in Southland Conference football action on Louis Bonnette Field at Cowboy Stadium in Lake Charles, La. Kickoff is set for 7:00 pm CST. McNeese State leads the series 23-11, with the Cowboys having won last year’s game 38-17. The Cowboys’ Josh Lewis kicked a 52-yard field goal as time ran out to give McNeese State a 13-10 victory over Southeastern Louisiana last weekend. The field goal was the third-longest in McNeese history and a career long for Lewis. It was his third game-winning kick in his career. Last year, he lifted the Cowboys past Appalachian State and Texas State. The win snapped a two-game losing streak. Andre Anderson led the McNeese running game with 74 yards on 21 carries while Cody Stroud completed 15-of-29 passes for 172 yards. Anderson was also the team's leading receiver with six catches for 37 yards while Diontae Spencer had 81 yards on two catches. McNeese is averaging 17.7 points and 317.0 yards per game and limiting opponents to 28.3 points and 363.6 yards per game. The defense allows 133.0 rushing yards per game, which ranks 41st in the FCS. Lewis has made 9-of-10 field goal tries this season and has the best field goal percentage in the Southland. Ths past week, the Colonels fumbled on their first possession of the game, gave up a touchdown, and never recovered in a 31-7 loss at home to Central Arkansas. Nicholls owned every major offensive statistical category in the game, including total yards (330-to-230), first downs (21-to-11) and time of possession (39:59-to-20:01), but three turnovers led to 21 Bears points. The Colonels were led by RB Jesse Turner with 178 total yards of offense, including 94 yards rushing and 84 receiving. He scored Nicholls' lone touchdown just 5 seconds into the fourth quarter. LB Jordan Piper registered 11 total tackles, including four solo stops, one for a loss and a pass break up. The Colonels rank 16th nationally in net punting with 36.5 net yards per punt. Patrick Dolan is 11th nationally with a net average of 42.5 yards per punt. Nicholls also ranks 28th in kick returns, averaging 22.7 yards per return. Joshua Warren ranks 33rd in the FCS, averaging 25.7 yards per kick return. McNeese is currently in third place in the Southland Conference, while Nicholls ranks number six in the conference. HOUSTON, TEXAS (October 30, 2010) The Houston Cougars (4-3, 3-1 C-USA) will travel to the state of Tennessee to take on the Memphis Tigers (1-6, 0-4 C-USA). Game time is set for 6:00pm at the Liberty Bowl. The contest will be the 19th meeting between Memphis and Houston, with the Cougars having a 6-5 record versus the Tigers while members of Conference USA. Overall, Houston leads the series 10-9, with a 4-4 record playing in Memphis. The first meeting between these foes was on November 30, 1963 with the Tigers winning 29-6. Last year, Houston downed Memphis 55-14 at Robertson Stadium. In Houston’s four wins, the Cougars have outscored their opponents by an average of 28.5 points. UH won by 40 in the season opener vs. Texas State, by 30 over UTEP, were 19-point winners over Tulane and won by 25 at SMU. Houston ranks in the top-25 nationally in total, passing and scoring offense. With 39.6 points per game, UH is ninth in the NCAA in scoring, while 284.4 passing yards per contest is 17th. The UH total offense is ranked 24th with 442.6 yards per game. UH has started true freshmen quarterbacks the past four games; David Piland vs. Mississippi State, at Rice and at SMU and Terrance Broadway against Tulane. Until the fourth game of the season, UH had not started a true freshman quarterback since Kevin Kolb in 2003. Twelve true-freshmen have played for the Cougars this season opener; TE Kenneth Bibbins, Jr., QB Terrance Broadway, DB Kent Brooks, DL Jeremiah Farley, DB Aaron Johnson, DB D.J. Jones, WR Darian Lazard, P Richie Leone, DB Zach McMillan, LB Efrem Oliphant, QB David Piland and LB Austin Wilson. With his two rushing touchdowns at SMU, junior running back Bryce Beall broke the school career record for rushing touchdowns with 32, topping Jackie Battle’s 31 scored from 2003-06. Beall also has 12 rushing touchdowns for the season which is three away from the school single-season record of 15. SAN MARCOS, TEXAS (October 29, 2010) The Lions of San Antonio Christian School entered the game versus San Marcos Academy having already claimed the district crown last week were as good as advertised as they dominated the Bears of SMA by a score of 43-0. The Lions took only one play to prove their dominance as Seth Kelly ran 59 yards for a touchdown for an early 7-0 lead. The Bears defense would stand tall as the Lions led 7-0 after the first period of play. In second quarter action, Kelly added a 9-yard run for a 13-0 lead. The Lions’ Chandler Schumann added a 30-yard pass reception for a 20-0 lead at the half. In first half action, the Bears were led rushing with 45 yards on 13 carries by Ty Merriweather. Seth Kelly for the Lions would roll up 138 yards on 6 carries and 2 touchdowns. Total yardage was close with a 188 to 182 Lions advantage at the half. With 9:16 left in the third quarter, Kelly added a 6-yard run as the lead grew to 27-0 after three quarters of play. The Lions added a safety on a blocked punt and two scores to take the 43-0 win. The Bears ended the game behind Quarterback Aubrey Oswalt as his pass fell incomplete in the end zone as the clock expired at A+FCU/Ingram Stadium on Gridiron Heroes/Senior Night. The Bears were led in passing by Jonathan Powell going 12 for 17 for 134 yards and 2 interceptions. Rushing the Bears was also led with Powell carrying the ball 19 times for 57 yards. The Bears rolled up 295 yards offense to 366 for SACS. The loss drops the Bears to 3-6 on the season and they will close out the season next week on the road in the Quarries at Hyde Park Baptist in Austin for a 7:30 p.m. scheduled kickoff. This is raw video shot at the Wings Over Houston Air Show at Ellington Field on Sunday, October 24, 2010. It is the reinactment of the Japanese attack on Pearl Harbor on Sunday, December 7, 1941 entitled Tora, Tora, Tora. The video was shot by Robert H. Kelly-TexSport Publications, Copyright 2010, All Rights Reserved. ARLINGTON, TEXAS (October 24, 2010) This one was for all the fans that had patiently watched and waited since 1960, back when the franchise was first known as the Washington Senators before moving to Texas with a manager named Ted Williams in 1972. With the ultimate gunslinger himself—Rangers president Nolan Ryan watching from the stands—the Texas Rangers put the half-century jinx to rest, downing their longtime playoff nemesis, the New York Yankees, in six games in the American League Championship Series to finally earn a spot in the World Series. No franchise had ever gone this long (50 seasons) without a visit to the Fall Classic. But now all of that bad karma is behind them, and no one could be more elated about the Rangers post-season triumphs than a special group of local youngsters who look to the Make-A-Wish Foundation® of North Texas for support as they battle life-threatening medical conditions. Nikco Sports announced it will continue to sell a special limited-edition Texas Rangers post-season baseball, and will add the official World Series logo to all 5,000 baseballs being manufactured by Rawlings. Each baseball comes with a handsome acrylic display case so that Rangers fans can showcase it at home or at the office. These officially licensed baseballs will be sold for $39.95 on a first-come basis to raise funds and grant wishes for the Make-A-Wish Foundation® of North Texas. They will be delivered to customers in plenty of time to use as a holiday or Christmas gift idea. In recent years, Nikco Sports has raised more than $1.7 million for children’s charities, including past projects in the state of Texas that have saluted the Dallas Cowboys, Houston Astros, Texas Longhorns football and San Antonio Spurs, as well as local stars such as Emmitt Smith, Troy Aikman, David Robinson, Craig Biggio and present day Rangers owner and Hall of Fame star pitcher Nolan Ryan. 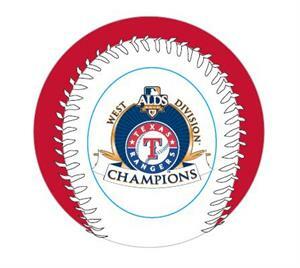 Fans can order the Rangers World Series Appearance baseballs at 1-800-345-2868 or by visiting www.nikcosports.com. Each baseball and case includes a numbered certificate of authenticity to enhance the value. Four dollars from each sale goes to the Make-A-Wish Foundation® of North Texas, with a potential goal of raising $20,000. Each panel of the baseball contains historical information about the Rangers franchise. One panel will contain the official Rangers team logo; another spotlights the official 2010 World Series logo; other panels will contain printed information that recaps the Rangers winning the American League Western Division title, the fourth divisional title in club history, as well as the divisional series win over Tampa Bay and the ALCS triumph over the Yankees. By winning all three games on the road in the first round of the playoffs, the Rangers made history in another way, as this was the first post-season series of any length in baseball history in which the road team won every game. The Rangers also won two of three road games in New York during the ALCS. “It certainly looks like the Rangers are a team of destiny with their play in the post-season and their goal of reaching the World Series for the first time in 50 seasons has finally been accomplished,” said Nikco Sports CEO Craig Bidner, whose company has given back regularly to communities since its inception in 1992. “Good things happen to those who wait, and Rangers fans and their patience certainly have been tested. During the past several years, Nikco Sports has raised more than $1.7 million for charitable organizations across the nation with the issue of limited-edition sports memorabilia that has honored amateur and professional teams, as well as select athletes such athletes as Dan Marino, Brett Favre, Jerome Bettis, Tim Tebow, Ben Roethlisberger, along with Peyton Manning, Jim Kelly, Carson Palmer, Steve Young, John Elway, David Robinson, John Stockton, Magic Johnson, Roger Clemens, Ryne Sandberg, Paul Molitor, Kirby Puckett, Stephen Strasburg, Edgar Martinez, Ichiro, Ozzie Smith, Mark McGwire, Ken Griffey Jr., Whitey Herzog, Nolan Ryan, Matt Garza, Tony Gwynn, Craig Biggio and Cal Ripken Jr. The Make-A-Wish Foundation® grants the wishes of children with life-threatening medical conditions to enrich the human experience with hope, strength and joy. Born in 1980 when a group of caring individuals helped a young boy fulfill his dream of becoming a police officer, the Foundation is now the largest wish-granting charity in the world, with 65 chapters in the U.S. and its territories. With the help of generous donors and nearly 25,000 volunteers, the Make-A-Wish Foundation grants more than 12,600 wishes a year and has granted more than 168,000 wishes in the U.S. since inception. The two schools have previously played 26 times over the years, with Houston holding a 26-10 record in the series. The first meeting on September 11, 1971 saw Houston winning 23-21 with their last meeting occurring last year, with the Cougars trouncing Rice 73-14. These two inner-city rivals, one of only two Football Bowl Subdivision rivalries that pits two schools from the same city. USC and UCLA is the other. The series vs. Rice is the longest running series in Houston football history. The 26 wins posted by the Cougars are the most Houston has against any other team in its 65-year history. The Cougars have recorded a 4-1 record versus the Owls while members of Conference USA. Houston posted a 16-4 mark versus Rice while a member of the Southwest Conference. Houston has the longest winning streak in the series, a six-game win streak from 1987-1992. The victor of this game will win the Bayou Bucket trophy presented by State Farm. UH head coach Kevin Sumlin is 1-1 vs. Rice in two games. The Cougars won, 73-14, in 2009 in Robertson Stadium and fell to Rice in 2008, 56-42 on the road. Game time is set for 2:30 p.m. at Rice Stadium. HOUSTON, TEXAS (September 12, 2010) Deborah Rihn-Harvey has been honored by the Wings Over Houston Airshow as the recipient of the 2010 Lloyd P. Nolen Lifetime Achievement in Aviation Award, which honors individuals, organizations, companies and corporations dedicated to the promotion or advancement of aviation. As one of the world’s leading aerobatic pilots, she is also the longest standing member of the United States Aerobatic Team and sets a world record for continuous participation in the World Championships. “Debby’s interest in aviation at a young age led to her success in the aerobatic world,” says Bill Roach, executive director of Wings Over Houston Airshow. When she first met Dr. Eoin Harvey her life changed forever. Dr. Harvey introduced Debby to the world of aerobatics, igniting a passion that continues to this day. 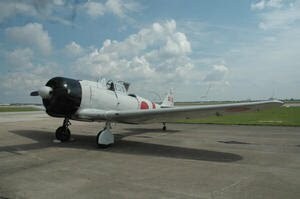 In 1979, Harvey & Rihn Aviation, a Fixed Base Operation with an emphasis on aerobatics and flight instruction, was established in LaPorte, Texas. She continued her professional growth by becoming an FAA Designated Flight Examiner in 1980 and an Aerobatic Competency Evaluator in 1984. Debby’s individual accomplishments rank her as one of the world’s leading aerobatic pilots. In 1983 Debby entered the upper echelon of aerobatic competition by qualifying for the USA Unlimited Aerobatic Team. She became the Women’s National Unlimited Champion in 1985 and has been awarded the Betty Skelton trophy for being the highest ranked Female in the Unlimited category eleven (11) times since 1998. Debby claims the prestigious title of US National Aerobatic Champion and has participated in 14 World Competitions. This impressive 27 years of continuous involvement makes Debby historically the longest standing member of the United States Aerobatic Team and sets a world record for continuous participation in the World Championships. Internationally she has won both individual and team medals and is a World Gold Medalist. She currently has earned more medals in World competition than anyone. Debby began flying commercially with Southwest Airlines in 1989 and was the eleventh female pilot to wear a Southwest Airlines uniform. She became a Southwest Airlines Captain in 1994 and has logged in excess of 28,000 hours of flight time. She is a member of the Aviation Advisory Boards for the City of La Porte and San Jacinto College. She is a current Board member for the International Aerobatic Club and represents the US internationally as a delegate to CIVA. Previous Llyod P. Nolan honorees include Gordon Bethune, Gene Kranz, Maybelle Fletcher, Ralph Royce, Herb Kelleher, Charles Hutchins, Tuskegee Airmen, Joe Foss, Captain John W. Young, Brigadier General David “Tex” Hill, Marvin “Lefty” Gardner, Vic Agather, Bob Hoover, Anthony LeVier, Burt Rutan, Major General Joe Engle, Mayor General William Anders, Paul Poberezny, the 147th Fighter Wing/111th Fighter Squadron of the Texas Air National Guard, General Reg Urschler and Gene Soucy. HOUSTON, TEXAS (October 11, 2010) The 26th Annual Wings Over Houston Airshow will be returning to Ellington Field on October 23-24, 2010 with gamer opening at 8:00am. Fans will be treated to static displays, civilian and military demonstrations and activities for the entire family. Civilian demonstrations include Sean D. Tucker and Team Oracle, Julie Clark’s Chevron Mentor, John Klatt Airshows, Smoke-N-Thunder Jet Shows, the Korea/Vietnam War Air Power Performance, RE/MAX Skydive Team, and radio controlled aircraft demonstration. In addition, there will be World War II air power reenactments including Tora! Tora! Tora!, an explosive recreation of the air attack on Pearl Harbor, and other famous battles. The military demonstrations include the US Air Force Thunderbirds, which is the headline act of the show, a C-47 & C-17 Cargo Heritage Flight, the A-10 West Coast Demo Team. In addition, the F-18C Hornet from the West Coast Demo Team VFA-125 Rough Riders and a C-130 Cargo drop by the 136th Airlift Wing will also be in attendance. Static displays include interactive displays by NASA and the “Legends & Heroes Autograph Tent” where air show fans can meet and greet famous aviation heroes and air show performers. An aircraft M-4 simulator will also be available to give attendees a chance to see what it is like to fly in a fighter aircraft and a children’s carnival area, with includes rock climbing walls, power jumpers and much more. Tickets can be obtained by visiting the Wings Over Houston website at www.wingsoverhouston.com or by calling 713.266.4492. HOUSTON, TEXAS (October 9, 2010) The Houston Cougars’ defense could not hold off an aggressive Mississippi State Bulldog offense, recording their second loss of the season, 47-24 at Robertson Stadium. The defeat was the first for the Cougars at home since a 37-35 loss to Conference USA-rival East Carolina on Sept. 29, 2007. The loss was the first for head coach Kevin Sumlin in front of the home-town crowd. Houston got on the board first at the 12:02 mark of the first quarter. Starting quarterback David Piland hit Kierrie Johnson on an 18-yard pass play to give the Cougars the first points of the game. The drive consisted of eight plays for 64 yards. The Bulldogs came right back with Leon Berry returning the kickoff 23 yards to their 30-yard line. After 5 plays, the Bulldogs were forced to punt. Cougar receiver Patrick Edwards fumbled the catch, which was recovered by the Bulldogs on the Houston seven-yard line. MSU drove seven yards on two played to tie the score at seven on a five-yard run by Vick Ballard. The Bulldogs continued their offensive punch, scoring their second and third touchdowns at the 6:20 and :13 marks of the quarter with Chris Relf scoring on q five-yard run and Ballard adding another touchdown to his total on a 12-yard scamper. The Bulldogs added a safety as the quarter ended to make the score 23-7 after 15 minutes. The second quarter saw the scoring subside a bit with both teams trading field goals. MSU scored on a 47-yard attempt that Houston matched with a 32-yard Matt Hogan kick at the 4:51 mark. With 23 seconds left in the half, the Bulldogs added another touchdown when Corey Bloomfield snagged a Piland pass, returning it 27 yards for the score. MSU retired to the dressing rooms with a 33-10 lead at the half. Ballard continued his scoring on another 12-yard run with only two minutes gone in the second half. Houston finally got its second touchdown on a 17-yard pass from Piland to Edwards midway through the 3rd quarter to make the score 40-17 in favor of MSU. Freshman quarterback Terrance Broadway came into the game with seven minutes remaining in the 4th quarter, right after MSU scored its final touchdown of the evening. LaDarius Perkins scored on a 20-yard run which resulted in the score being 47-17. Broadway drove 73 yards in six plays, concluding with a 17-yard pass to Isaiah Sweeney. That touchdown was the final score of the game. Offensively, Piland went 30 of 57 for 301 yards in the air, while throwing for two touchdowns. Tyron Carrier caught 10 passes for 9 yards, while E.J. Smith caught four passes for 86 yards. The Cougars gave up 538 yards on defense while playing 39 minutes of the game. Houston is now 3-2 on the season, while remaining 2-0 in Conference USA play. The Bulldogs raised the season record to 4-1 for the season while maintaining their 1-2 record in the SEC. Houston will travel across town to face long time rival Rice next Saturday at 2:30pm. Rice is 1-5 for the season and 0-2 in C-USA action after losing to UTEP 44-24 in El Paso on Saturday night. HOUSTON, TEXAS (October 9, 2010) The Houston Cougars (3-1, 2-0 C-USA) will face off against the Mississippi State Bulldogs (3-2, 1-2 SEC) Saturday evening at Robertson Stadium with the game slated for a 7:00pm kickoff. The game is the 16th meeting between the two schools, with the Cougars leading the series 9-6 and by a 4-3 margin at home. Mississippi State will be playing at Robertson Stadium for only the second time, despite playing seven games in Houston. The previous match-ups in 1956, 1961, and 1962 were played at Rice Stadium, while the 1965, 1966, and 1969 games were played in The Astrodome. In 2003, Houston won 42-35 over the Bulldogs at the Rob. Last season UH defeated MSU in Starkville, 31-24. With the score tied entering the final period, the Cougars took advantage of two Mississippi State turnovers and converted them into touchdowns for the win. Bryce Beall rushed for 94 yards and receivers Tyron Carrier and James Cleveland each caught two touchdown passes. Defensively, Marcus McGraw led with 13 tackles. Unfortunately, Houston will be with the services of Cleveland against MSU. Earlier in the week, Cleveland was suspended from Saturday’s game by head coach Kevin Sumlin for a violation of team rules. “James made a mistake, which is uncharacteristic of him. I am disappointed because up until now he has done everything we have asked of him. He is very remorseful and hopefully will use this as a learning experience and be ready to go next week,” stated Sumlin in a prepared statement. The game will also have an added appeal for fans as former Texas Tech head coach Mike Leach will be in the press box at the Rob. The game will be televised on CBS-College Sports with Leach handling the game analysis as a compliment to the play-by-play of Roger Twibell. The Cougars are listed as 5 ½ point underdogs going into the game. SAN MARCOS, TEXAS (October 8, 2010) The Panthers of Texas Military Institute of San Antonio spoiled festivities for the Bears of San Marcos Academy on Homecoming at A+FCU/Ingram Stadium with a pair of interceptions in a 27-13 loss. 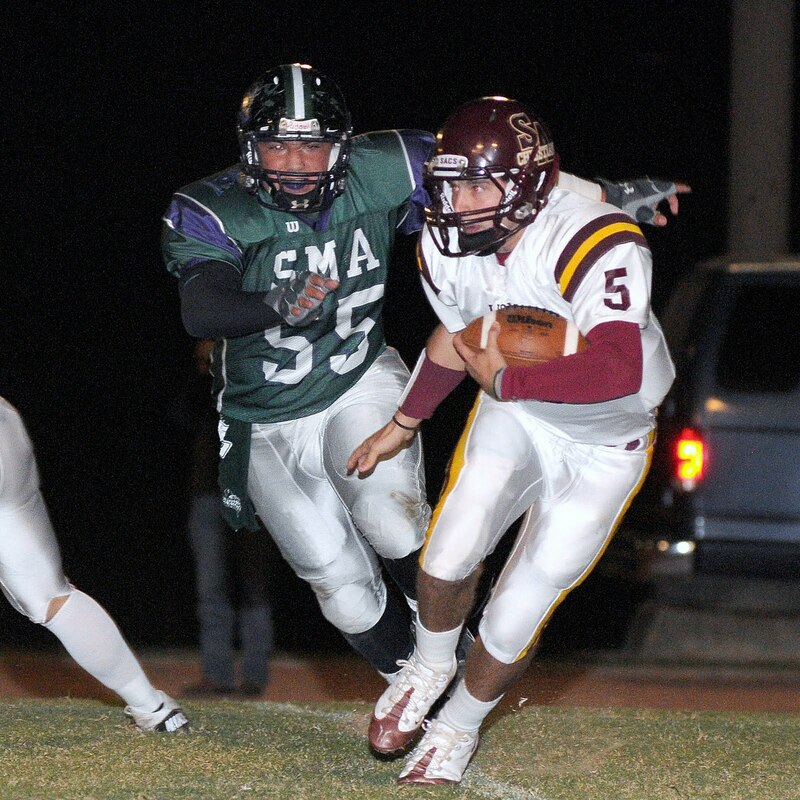 The loss put a big dent into SMA’s playoff chances for 2010. The Bears started the rivalry in 1927 with a 19-0 win but had not won in their last two matchups against the Panthers with the Bears falling 34-13 last season on the road. In first quarter action, both teams battled back and forth with a pair of four and outs until the Bears would drive deep into Panthers territory, the drive would be stalled after a overthrown pass by Jonathan Powell to Cameron Whitehead to leave the score 0-0 after the first stanza. The interception stopped the Bears momentum and it went downhill from there for the home team. The Panthers would score first Matthew Tawil would add a 3- yard run with Cody West on the PAT for a 7-0 lead with 8:05 left in the first half to end first half scoring. Sailor Metz would dash in for a 1-yard run with 7:12 left in the third quarter, the PAT by West would give the Panthers a commanding 14-0 lead. The Panthers would stretch their lead to 21-0; Metz would strike again on a 4-yard run to push the lead to 21-0 with 10:14 left in the game. The interception bug would strike the Bears again but they struck back with a score with 6:59 left in the final quarter as Ty Merriweather scores from the 1-yard line. The PAT by Memo Borrego was good to cut the deficit to 21-7. TMI’s Metz would tack on a 10-yard run off the right side for good measure with 4:01 left in the game but Josh McIntyre would block the PAT to end scoring for the night. McIntyre would finally connect on a pass as he caught a wide open Brett Mackall on a 30-yard pass and the Bears would fail on their 2-point conversion as the Bears closed the gap to 27-13. The Panthers dominated statistics in the game, as they outgained SMA 407-218 in total yardage, but the largest margin was in first downs 23-11. Defensively, the Bears were led in tackles by Sophomore Estevan Gutierrez with 15, followed by Shane Boyer and Aubrey Oswalt with 9 each for the game. The Bears return to action next week for their longest road trip of the year as they take on a much improved Pope John Paul II Centurion squad. The Centurions stand at 3-3 after a bye week with all three wins this season coming against UIL teams. LAKE CHARLES LOUISIANA (October 7, 2010) The Houston Professional Indoor Football Team of the Southern Indoor Football League introduced their team name, logo, and colors in a press conference held at the Coach’s Sports Bar and Grill. In attendance were more than sixty excited participants including media, sponsors, fans, coaches, players, and Don Elder, Jr. the Mayor of Katy. The team name was chosen from the top five submissions from local fans. “As an organization we have some tremendous ideas for the upcoming season, but we really wanted to reach out to the fans and ask them to submit names befitting our market”, said Steve Hooks, co-owner of the Stallions. Coach Dockery played an important role in the design of the logo reviewing sketches, color options, and even sew outs. “The final design came from Blackat Productions. It incorporated everything we were looking for including motion and strength”, said Coach “Doc”. The Houston Stallions chose red, white, and black for passion, strength, and simplicity. Open tryouts have been set for Saturday October 9th at Cross Point Community Church Athletic Field. Interested players should contact Coach Dockery at 832-671-3603. For information regarding the Southern Indoor Football League, visit www.southernifl.com. HOUSTON, TEXAS (October 3, 2010) After a week off posting a 3-1 record for the 2010 season, the Houston Cougars will face Mississippi State on Oct. 9 at Robertson Stadium. The Cougars will take on a Bulldog team that 3-2 for the season that has outscored its opponents 143-81 while averaging 28 points per game. They are averaging 172 yards rushing and 220 yard passing per game while holding their opponents to a 313 total yardage per game. The game against Houston will be the second road trip for the Bulldogs, having previously lost on the road to LSU 29-7 in Baton Rouge. Houston will be shooting for their fourth win of the season, having previously beating Texas State 68-28, UTEP 54-24 and Tulane 42-23. Their only loss this season was a 31-13 defeat to UCLA at the Rose Bowl. The Cougars have outscored their opponents 177-106 and are averaging 44 points per game. They are averaging 465 yards of total yardage per game while employing a balanced running and passing attack. Their 742 yards of total rushing and 1120 yards of total passing equates to an average of 185 yards and 280 yards per game, respectively. Their balanced rushing and passing attack has combined for 22 touchdowns (14 rushing, 8 passing) with two of them coming from interception returns. Houston’s Bryce Beall is currently leading Conference USA in rushing, averaging 104.5 yards a game and in scoring, averaging 13.5 points a game. Patrick Edwards is leading C-USA in punt returns, with 11 returns in four games for 162 yards, averaging 14.7 yards a game. Game time against Mississippi State is set for 7:00pm Houston time. BEAUMONT, TEXAS (October 2, 2010) The Sam Houston State Bearcats jumped out to an early 14-0 lead in the first quarter; going on to defeat the Lamar Cardinals 38-10 at Provost Umphrey Stadium at home in Southland Conference football action. Bearcats running back Tim Flanders rushed for 153 yards and three touchdowns to give Sam Houston its second win of the season. With the loss, the Cardinals drop to 2-3 on the season. The Cardinals first two scores came on a punt return by Brando Closner and a 3-yard pass reception by Seth Patterson. Closner’s touchdown was the result of the Cardinal’s punt on 4th and 6, in which he returned the ball 39 yards for the score. Patterson’s score came after an 11 play 58-yard drive at the 2:15 mark of the 1st quarter. He caught a pass from quarterback Brian Bell for a three yard gain and the score. Lamar got their first score of the game on a 36-yard field goal at the 14:51 mark of the 2nd quarter. The Bearcats answered back with two touchdown runs by Tim Flanders. He ran for 27 yards and the third touchdown of the game at the 7:43 mark in the 2nd quarter and added the Bearcats fourth touchdown on a 1-yard run with 4:32 left in the half. Flanders continued his dominance of the Cardinals, scoring his third TD of the game on a 32yard run to take the score to 35-3 at 9:31 in the third quarter. Lamar finally scored their first touchdown on a first and 10 pass at their own 33 yard line. Quarterback Andre Bevil found Marcus Jackson open across the middle and hit him for a 66-yard passing touchdown. The Bearcats added a field goal from the 18-yard line to take a 38-10 lead with 15 minutes to go. Sam Houston will next face Nicholls State on Oct. 9 with a 4:00pm start on the road, while Lamar will face Langston University on the same day with their first football homecoming celebration in 20 years.